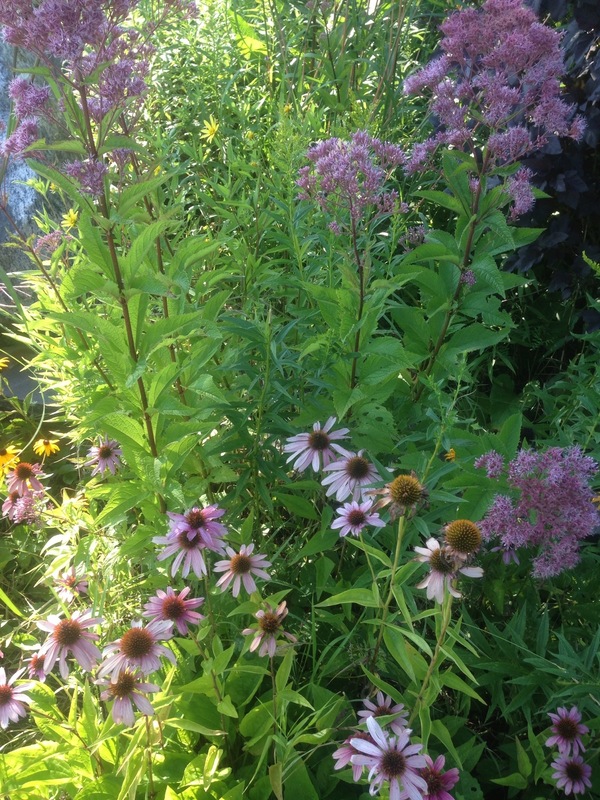 Natural gardens and natural landscaping with Joe Pye Weed (Eupatorium maculatum) and Coneflower (Echinacea purpurea). Is it possible to integrate the use of the native plants used in wildlife gardening into preventative, herbal health care? Wildlife gardening medicine may just be the future trend needed to turn the tides on the environmental and extinction crises. If people want to have as many native plants growing on their property as possible to ensure there are enough stock plants for their family’s medicinal use harvesting, then maybe our beloved native plants, even the obscure ones would finally become less marginalized in the landscape. The abundance of native plants in America that have a history of medicinal use (mostly by First Nations people) is much too extensive to be captured in a short post like this. There’s a lot we don’t have records of and most likely a lot we haven’t yet discovered too. I’ve chosen a handful of my favorite native plants that are used in wildlife gardening and have historical records of miraculous herbal healing properties to model this concept, but this barely scratches the surface of the potential healing power and historical use of our native flora. The taller pink flowered plant in the photo above is Eupatorium maculata or E. purpureum or Joe Pye Weed. The plant was named for a First Nations healer who was called, Joe Pye. Mr. Joe Pye successfuly stopped a burgeoning Typhus epidemic infecting European settlers in New England using Eupatorium purpureum as the core substance of his herbal treatment protocol. (source- Healing Lyme Disease Naturally, by Wolf D. Storl, page 305). Joe Pye Weed has also been traditionally used for healing venereal diseases of bacterial origin. In fact, all of the Eupatorium species have been used for this purpose. Gorgeous Boneset flower (Eupatorium perfoliatum). Black-Eye Susan (Rudbeckia fulgida) in the background. 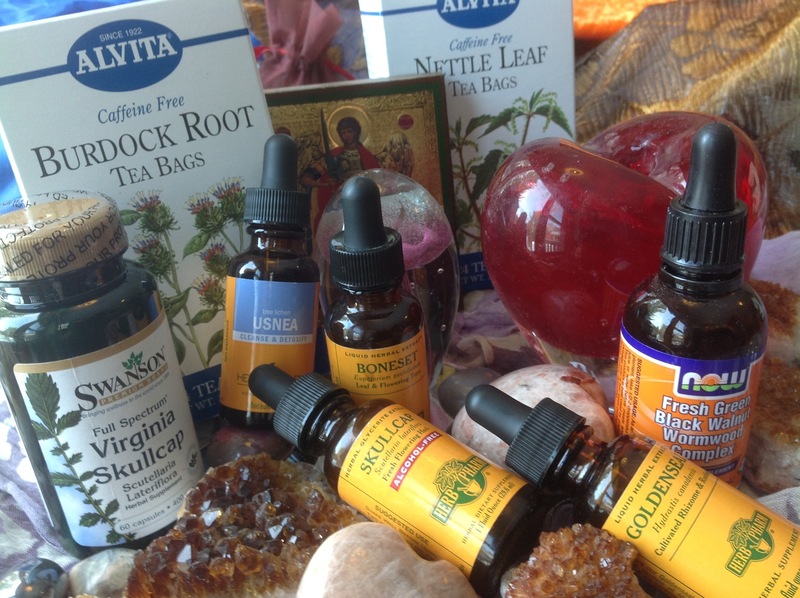 An assortment of herbal medicine made from native plants that could be used for wildlife gardening in Saratoga Springs, NY. Eupatorium perfoliatum or Boneset’s elegant plant skeletal-like structure initially nudged the tribal plant healers to experiment with its use in healing problems with pain in the bones, like arthritis. It actually ended up being an exceptional remedy for this purpose. 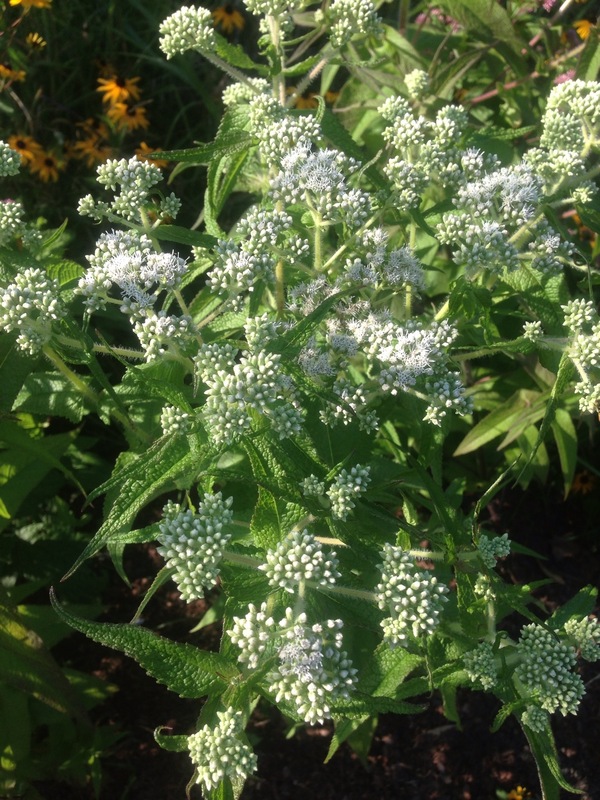 Boneset has many common names including three that went out of fashion in 1885: Agueweed, Feverwort and Sweating Plant. Boneset is used for the treatment of fever chills and other problems of influenza. The sesquiterpene lactones in E. perfoliatum stimulate the immune system, are reported to combat cancer cells and have a pain relief component that easily matches the effectiveness of aspirin. The aerial flower parts are what is used medicinally, and can be fresh harvested and infused in hot bath water for a full body penetrating relief of arthritis-like pain and/or fever reduction. (source, Herbal Antibiotics, Stephen Harrod Buhner, pages 265-268). 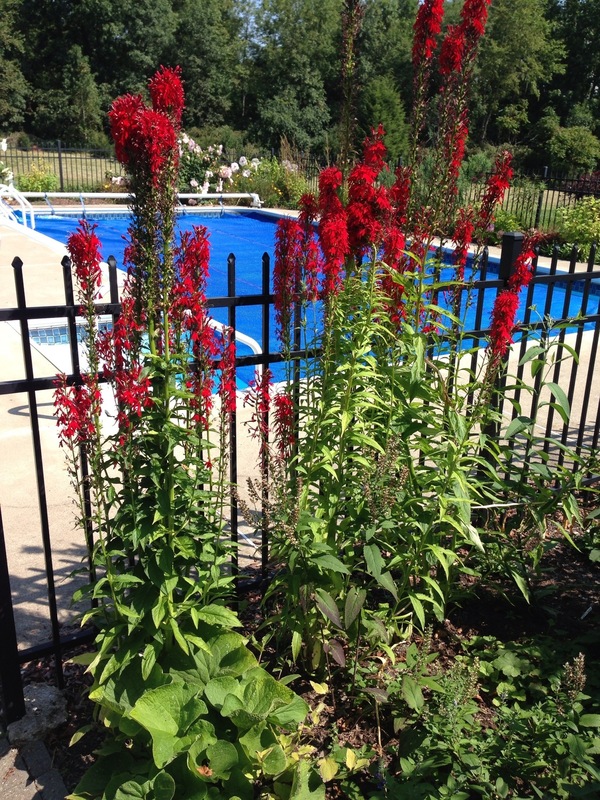 Native plant Cardinal Lobelia (Lobelia cardinalis) in bloom in Clifton Park, NY. There are between 200-350 species of Scutellaria, or Skullcap worldwide, and they have been used medicinally on every continent. Oftentimes the regionally native species are the most useful to the people who live there, because the vitality and healing potentcy (known as chi in tradional Chinese medicine) seems to be strengthened in a plant that is growing in the region it is indigenous to. This is not always gospel, though, concerning the Scutellarias; some of the species potency or specific actions are intrinsic. Also, there have been upwards of 600 journal articles done on the medicinal properties and successful treatments of the Chinese Scullcap species, S. baicalensis compared to a measly 24 articles on the efficacy of the most widely used American Skullcap, S. lateriflora. There is so much we don’t know. The master herbalist Stephen Harrod Buhner hypothesizes that the American Skullcap species are probably as potent and medicinally valuable as the universally worshipped Chinese varieties, but people default to the Chinese Skullcaps and we lack this information. Stephen Buhner encourages open-minded people in North America, especially on the east coast to grow their regionally indigenous Skullcaps liberally and experiment with treating themselves medicinally with the plants aerial flower parts combined with root parts, and give him the anecdotal feedback by email. (source, Herbal Antivirals, Stephen Buhner, pages 125-127.) 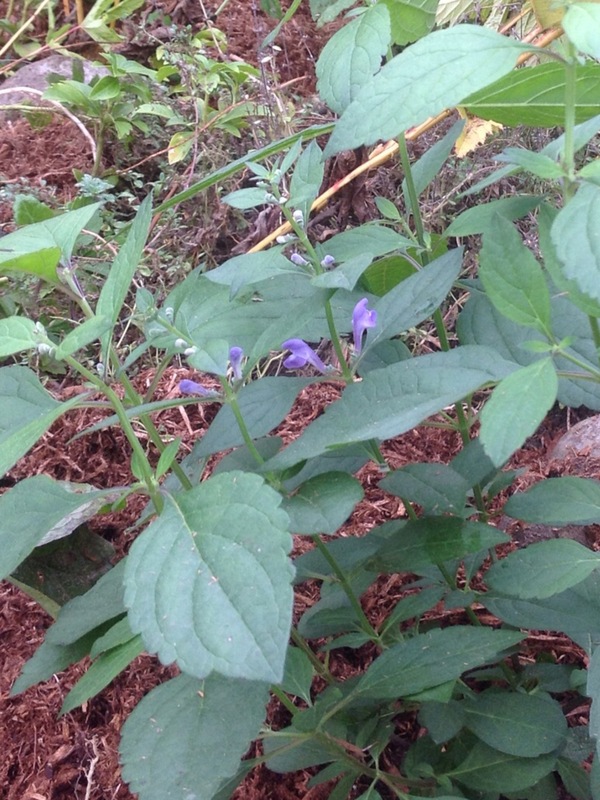 Skullcap is used cumulatively with many other herbs in the treatment of Lyme disease, which is a bacterial infection. The Scutellarias are also used in the treatments of viral infections and are wonderful anti-inflammatory agents, which makes them an exceptional herbal medicine for inflammatory sourced conditions like arthritis, chronic inflammation, taxed organs and muscle pain. The fact that Asclepias tuberosa (Orange Milkweed or Butterflyweed) is a larval host plant for Monarch butterflies and is, in a parallel world, known to herbal practitioners as pleurisy root for its efficacy in pulmonary issues literally gets me out of bed some mornings. Wildlife Gardening Medicine might just be the answer for multiple crises on terra firma. At the very least it’ll be interesting to learn more about the healing properties available of our beautiful native plants.